We always thought that you had to see the polar bears in the winter. We had visions of massive glassed-in buggies crossing the white tundra landscape packed with people in search of the great polar bear. We never thought of walking with polar bears. Everyone knows that the polar bear is a dangerous bear and one of the few animals on earth that has actually been known to stalk humans. In other words, you should stay away from polar bears right? 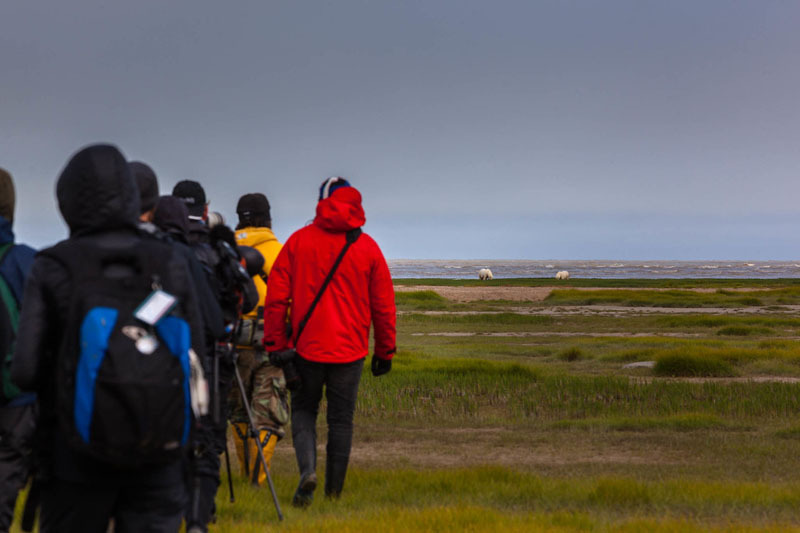 So when we heard we'd be walking with Polar Bears on our safari with Nanuk Lodge near Churchill, Manitoba we were intrigued, to say the least. We met our group at the Winnipeg Airport where we spent the night at the attached Grand Winnipeg Airport Hotel before an early morning flight to Churchill. 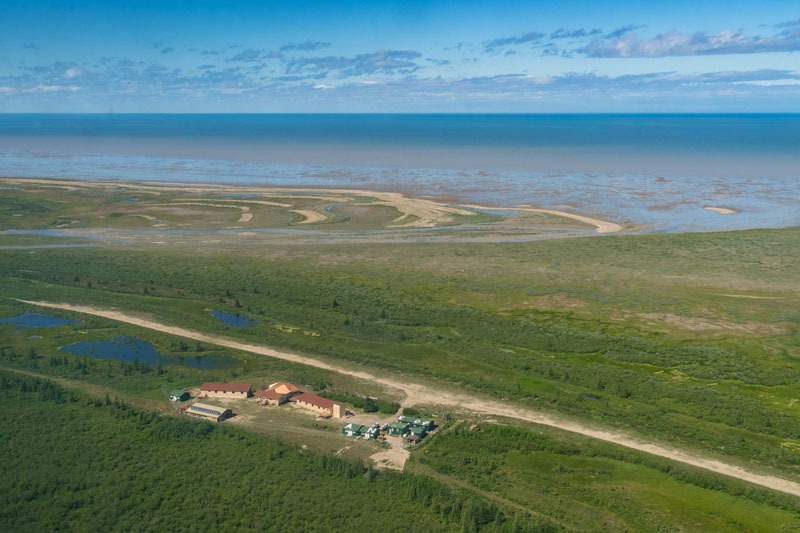 Our trip was taking us to a remote region of the Canadian Province where we flew into a lonely, but lovely lodge on the Hudson Bay. Our journey took us on a flight in a small cargo plane and then another on a tiny twin otter to a dusty airstrip in the middle of nowhere. There wasn't an ounce of civilization for 100 miles. We were in the middle of the Arctic Tundra surrounded by nothing but hundreds of polar bears, black bears, wolves, and moose. 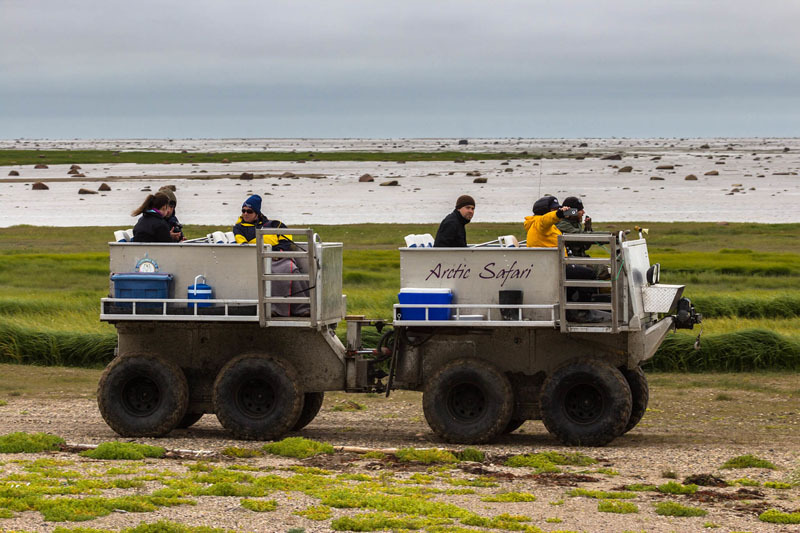 When we arrived at the lodge, we were immediately escorted to our fenced in compound and given a hearty lunch with hot tea before heading out on our specially designed rhino vehicles in search of polar bears. Churchill Wild has been running polar bear tours for 25 years and is the leader in Polar Bear expeditions. Nanuk Lodge is their newest lodge and probably their most interesting tour. 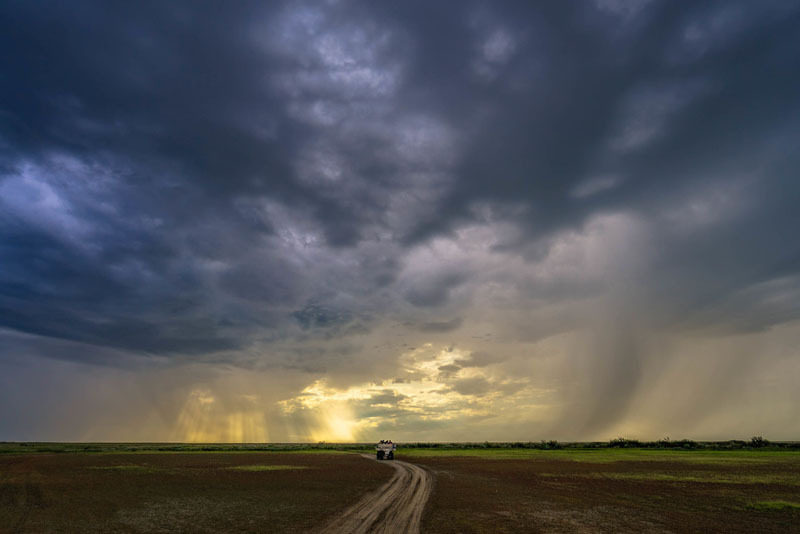 Our time on the tundra consisted of a mix of driving safaris and walking safaris, making for the perfect mix of adventure and relaxation. 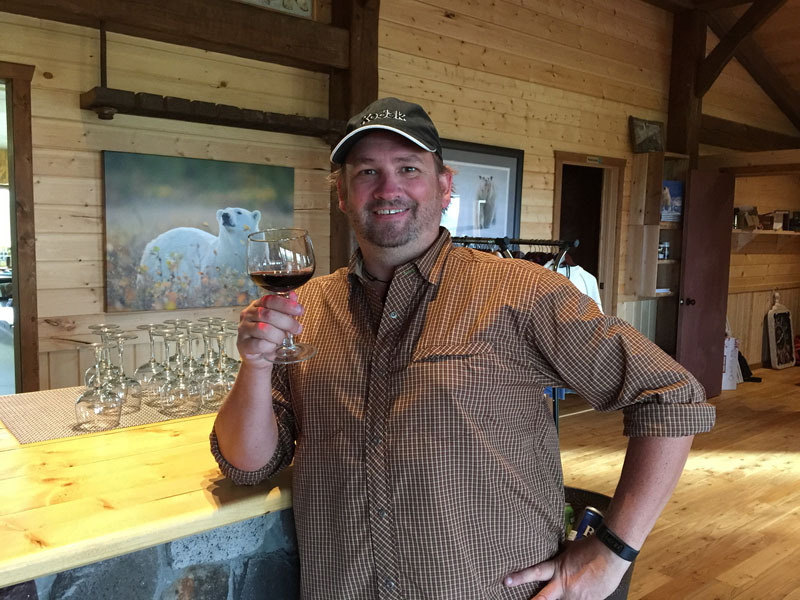 Before venturing out beyond the fences, our guide Andy discussed all safety procedures. It was imperative that we followed his instructions and listened to his directions when we were out in the Canadian wild. When walking with polar bears, you don't want to make any wrong moves. The Churchill Wild guides are experts and kept us safe but it's important to follow their rules and listen to what they had to say. We split up into two vehicles with one group going with Andy and the other with our guide Albert. Each guide was armed with a shotgun and handgun. But more importantly, they had several means of scaring off a polar bear before having to take any deadly force. They had polar bear distractions called bangers and screamers that make loud noises and shoot streams of colour when aimed at a polar bear. See more Polar Bear photos at our post: Be Transported to the Wild Edge of Manitoba. Should a bear become hostile, these tools would most likely scare them off without having to shoot real bullets. Our guides were also armed with bear spray, which Andy said he has never had to use. He and Albert instead rely on their knowledge of bear behaviour. The precautions they took while approaching any animal in the wild made everyone feel at ease. Andy told us that he'd been guiding for years and has never once had to shoot his gun and has rarely had to use the screamers or bangers. We were after all on the animal's turf and any deadly force should only be as a last resort. None of us were planning on provoking a polar bear to attack. 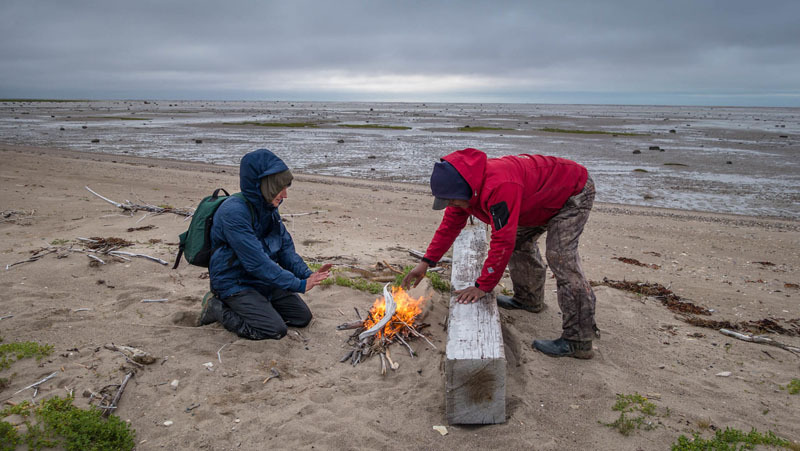 Most of our three days at Nanuk Lodge were spent out on the coast of the Hudson Bay searching for polar bears and then walking with polar bears. The lodge was outfitted with binoculars and scopes where the staff kept a constant lookout for polar bears out in the distance. 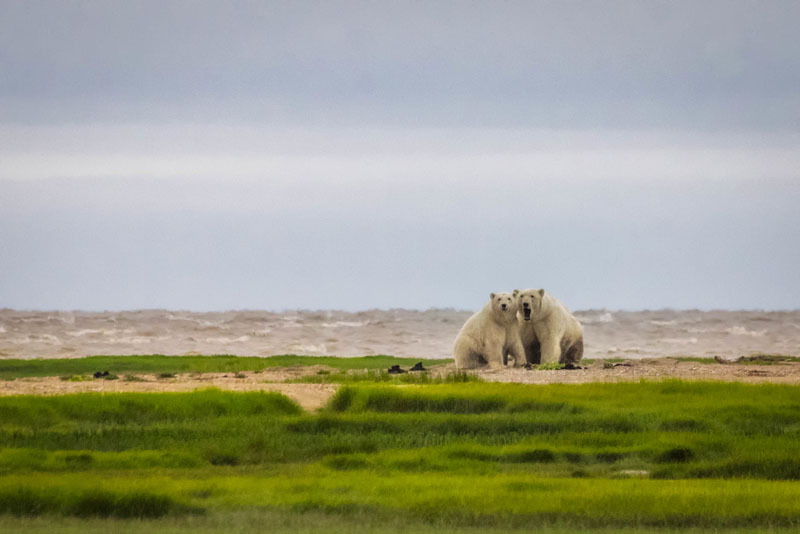 It was late summer and the perfect time to spot polar bears on the coastal region of Manitoba. Nanuk Lodge is situated smack dab in the middle of a denning area for polar bears where mothers and cubs spend their summers. Each morning, our guides had a clear idea of which way they would head in search of bears. It wasn't long before we came upon a mother and her cub relaxing on the coast. 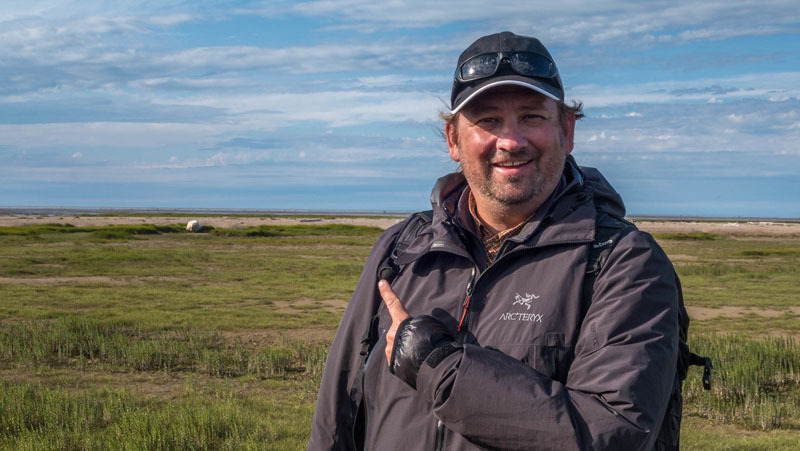 During our flight out to the lodge, we saw at least a dozen bears walking and during our safari, we saw four polar bears at close proximity during our walking safaris with at least another half a dozen in the distance. It was truly mesmerizing. 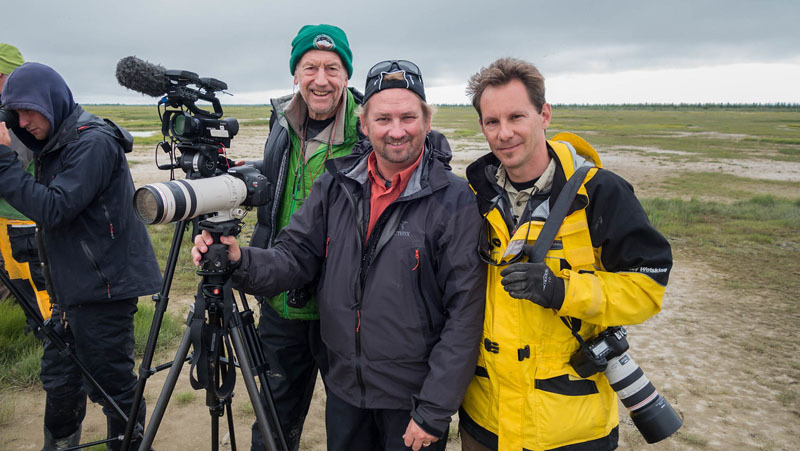 We set out each day on our Arctic rhinos in the direction of the last polar bear spotting and eventually saw what we were looking for on the horizon. Andy and Albert would then drive towards the bear until we reached close enough to start a hike towards it. When we got out of the rhinos, we had strict instructions to walk in single file and to avoid making sudden movements or noise. Plus we had to stay behind Andy at all times while Albert kept a lookout in the back. It was exciting to walk across the tundra through streams and rough terrain. 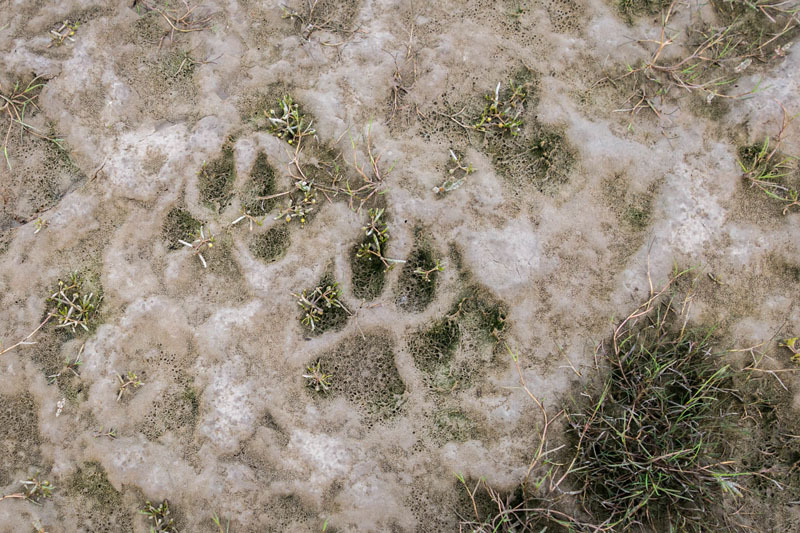 We saw wolf and moose tracks along with the massive polar bear tracks. We may not have always seen the wildlife that surrounded us, but it was all certainly there. The polar bears knew we were coming, they could sense us and they took notice. But for the most part, they didn't bother with us. They went about their daily business of sleeping or swimming in the sea as we watched on from 50 to 100 metres away. Polar bears are the largest carnivores on earth and to see them with your own two eyes as you stand exposed on the stark Canadian landscape, makes you realize just how small and vulnerable we are as human beings. These creatures are at the top of the food chain, but even though they are massive, when you are standing in a group at a safe distance with knowledgeable guides, you can truly appreciate their beauty. Polar bears move fast and they could be at our location in a heartbeat. I felt safer watching from afar and I believe a safari is about putting as little impact on wildlife as possible. Farther away is less stressful for them. We could watch the bears for hours and we often did. But driving along the tundra was just as exciting as seeing the polar bears. 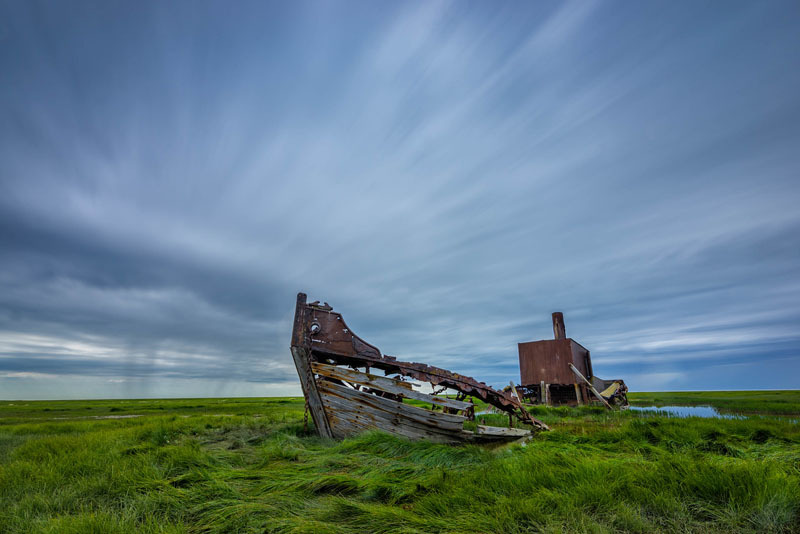 We searched for and ate fresh strawberries, visited a shipwreck on the shore and even spied a bull moose in the middle of the bush for one split second. We got stuck in the deep mud and we explored countless miles along the coast as Albert told us stories of his life growing up as a Cree in North America'sFirst Nations. He knew this land like the back of his hand. The Arctic is his home. I could listen to Albert talk for hours. We weren't outside 24 hours a day though. The Nanuk Lodge is a cozy and comfortable lodge with wood burning stoves, an excellent chef and kitchen staff preparing three meals a day. They even presentations to keep us occupied at night as we sipped wine by the fire. We were lucky enough to be visiting the lodge while Storm Chaser, George Korounis was filming an episode of his TV show Angry Planet. He put on a presentation for us all about his escapades around the world and our guide. Andy talked to us another evening about polar bear habitat and global warming. Our evenings at the lodge were as informative as they were entertaining. Even as we sat inside, we were treated to wildlife encounters. 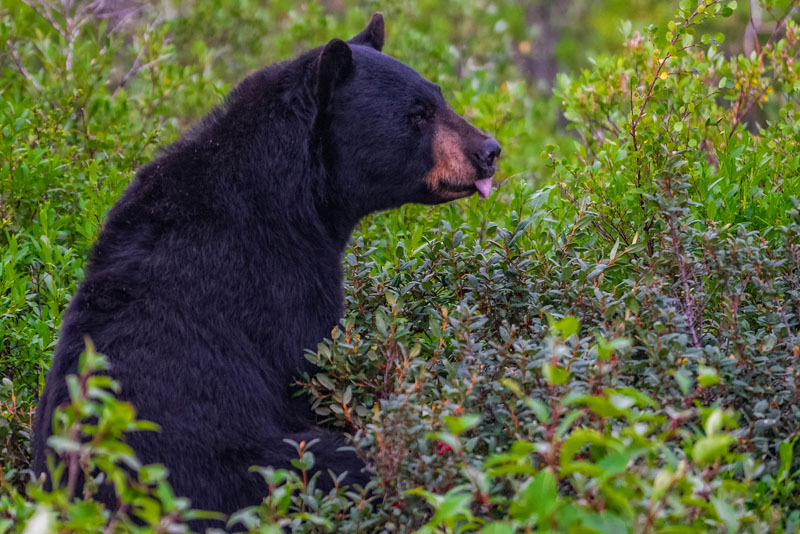 Black bears circled our compound foraging for berries and having heated stand offs with one another as they claimed their turf. We even had a large black wolf stop by to say hello. We had to stay inside the fence, but we could go outside and watch them from just a few feet away as they peeked in our direction every so often to see what we were up to. At night another show started. 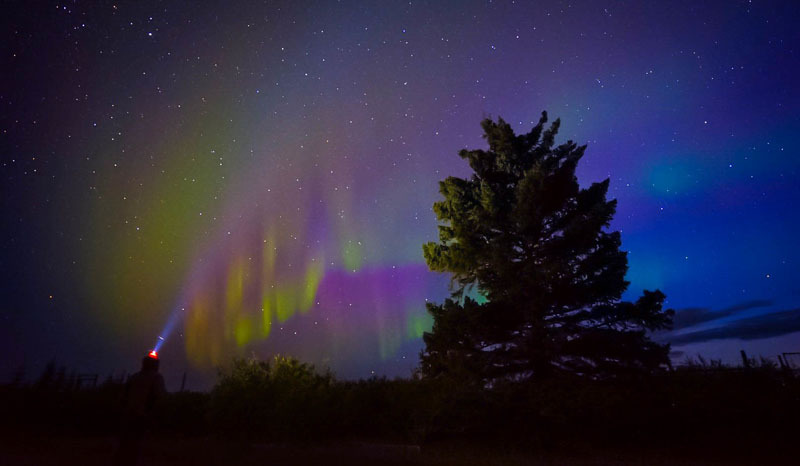 May people visit Canada's North to see the Northern Lights. The staff keeps a lookout for the Aurora Borealis and if they are active, you'll get a wake up call with a knock on your door. We were up at 2 am watching the lights dance in the sky. We had only seen the Northern Lights one other time in Greenland and this was a highlight for us to actually witness the dancing hues of green and magenta on our own soil. We could have easily slept through the display, but thanks to Churchill Wild, we saw it all unfold before our eyes. Visiting Nanuk Lodge to walk with polar bears was truly a magical experience. It reminded me of an African Safari, only with different majestic animals and cooler temperatures. 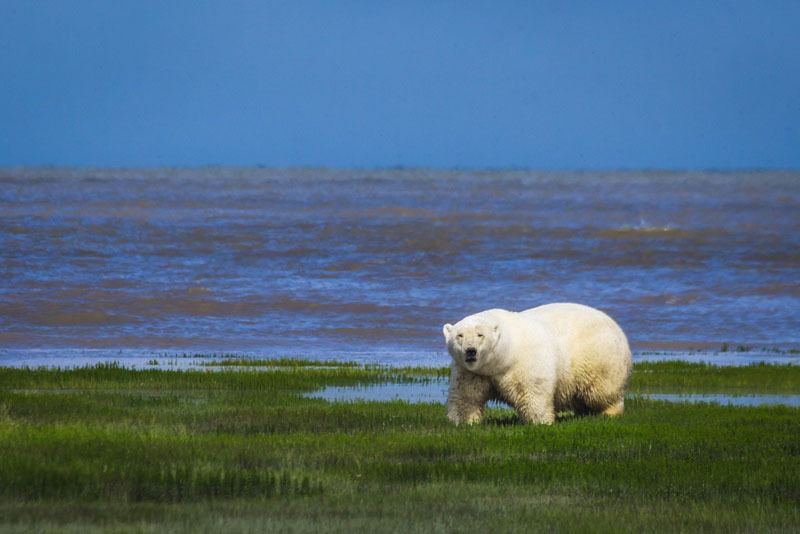 While the prime viewing times are October and November for polar bears in Churchill, late August and September give you the opportunity to experience Polar Bears like you never thought possible. 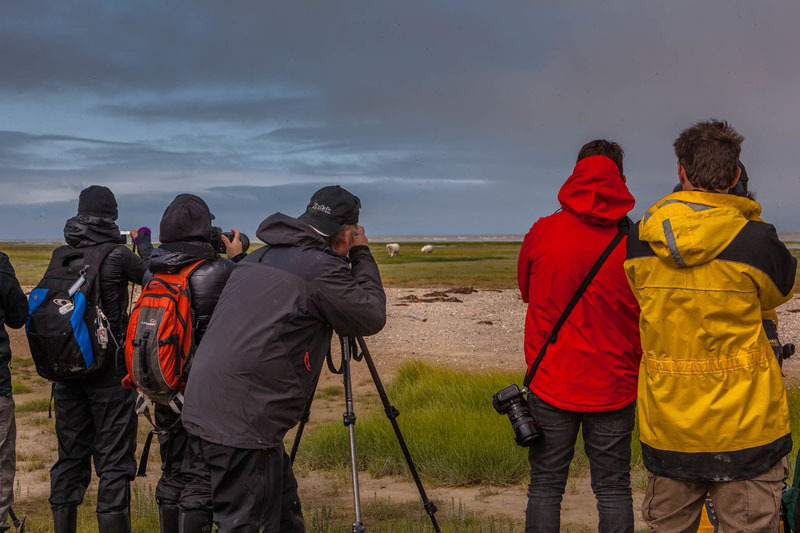 You don't have to sit behind the glass of a tundra vehicle to snap a photo of them in the snow, instead, you can walk right up to them within just a hundred or so feet and see them surrounded by the layered colours of summer on Hudson Bay. Either way you decide to see polar bears, you won't be disappointed. They are truly one of the most spectacular creatures on earth. To walk with polar bears is a dream come true and something we recommend everyone do! Find out more about polar safaris at Churchill Wild. 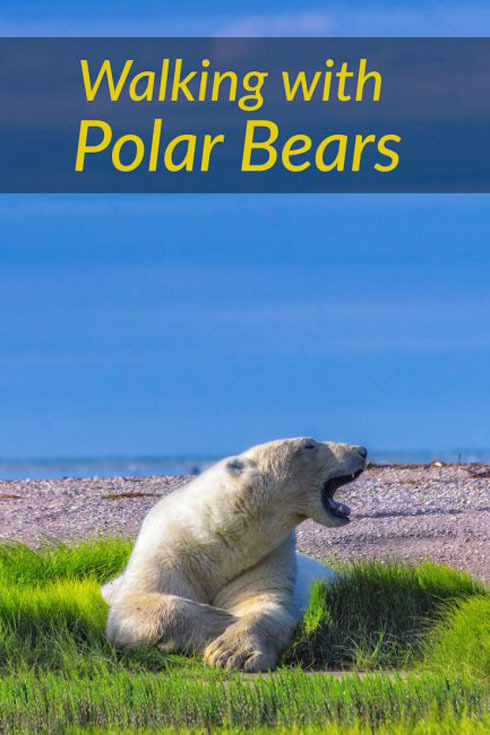 19 Responses to "Walking with Polar Bears – The Greatest Arctic Safari"
Hey Dave and Deb, was just reminiscing about our trip to Nanuk (had their book on our coffee table!) and remembering what a cool experience it was. I thought I read somewhere that you guys were heading back up there to a Churchill Wild lodge again? Is that true? I hope so! Keep up the awesome work guys. Hope to run into you again one day. 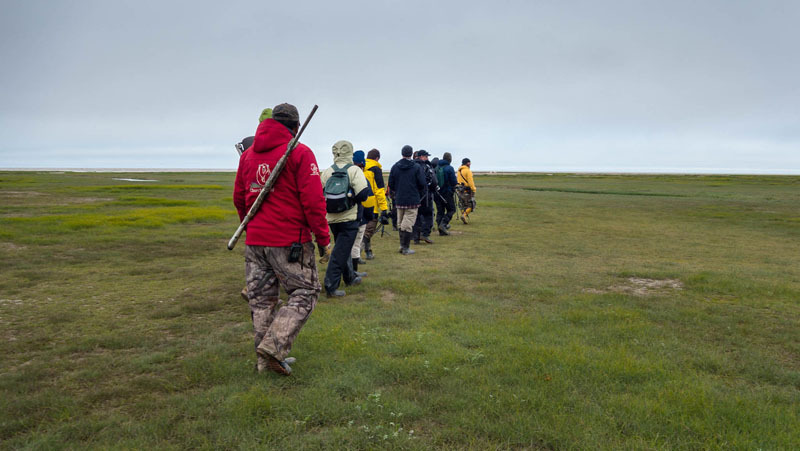 I love this post so much… I’m going to be heading to Nanuk Lodge later this year to do the walk and this story has made me all the more excited (and answers some of my questions!) so a big thank you for this one. Can’t wait to get over there and see polar bears for the first time in a very special way. Thank you Julius. It was such an amazing experience and we feel so lucky to have had the privilege to see them in the wild. It’s been something we’ve wanted to do for more than a decade. I hope that they adapt and survive so that generations will be able to view them for years to come. Before reading your article, I would never have considered walking with Polar Bears. Now, I may consider trying it. I would love to see them in their natural habitat without the danger. 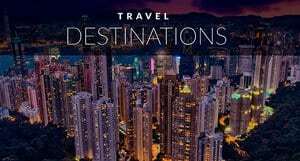 Seeing the Aurora Borealis would also be a great treat. 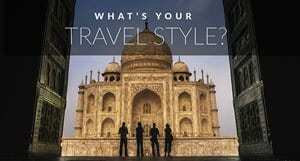 Very nice blog… i loved all the posts which you guys have put. Cheers to the team for putting so much of efforts on creating such a blog. Oh my goodness…what a nice places.. really all are peaceful and best places. mostly i like bears and i need to travel this type of peaceful places. oh my God, your photos are amazing! I love animals and can’t imagine an arctic safari like this, must have been incredible. Keep up the amazing work! 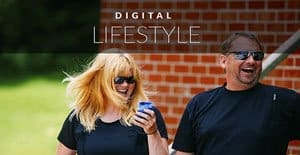 Nice article you guys put together! I was also with Andy @ Seal River. 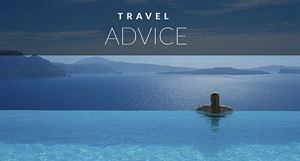 Awesome, excellent guide, both him & Tara. FYI, on YouTube, there’s an excellent 5 minute clip just on Andy McPherson titled “The Polar Bear Whisperer”. What you see is what you get. Funny guy, too. Cheers! The headline made me think I was going to hear stories about snow and blizzards. Nope. This is doable. I am not a huge fan of the cold so the arctic isn’t something that really captures my heart lol. Interesting to see this could be done in the summer where there’s no snow. I may have to keep that in the back of my head for a potential possibility :P.
Glad we could let you know about a warmer time to see the polar bears. I haven’t seen them in the winter, but seeing them at this time of year was truly magical. They were so contrasting against the green and brown landscape.